Predictive Analytics, Big Data, Hadoop, PMML: Online PMML Course @ UCSD Extension: Register today! Online PMML Course @ UCSD Extension: Register today! The Predictive Model Markup Language (PMML) standard is touted as the standard for predictive analytics and data mining models. It is allows for predictive models built in one application to be moved to another without any re-coding. PMML has become the imperative for companies wanting to extract value and insight from Big Data. In the Big Data era, the agile deployment of predictive models is imperative. Given the volume and velocity associated with Big Data, one cannot spend weeks or months re-coding a predictive model into the IT operational environment where it actually produces value (the fourth V in Big Data). Also, as predictive models become more complex through the use of random forest models, model ensembles, and deep learning neural networks, PMML becomes even more relevant since model recoding is simply not an option. 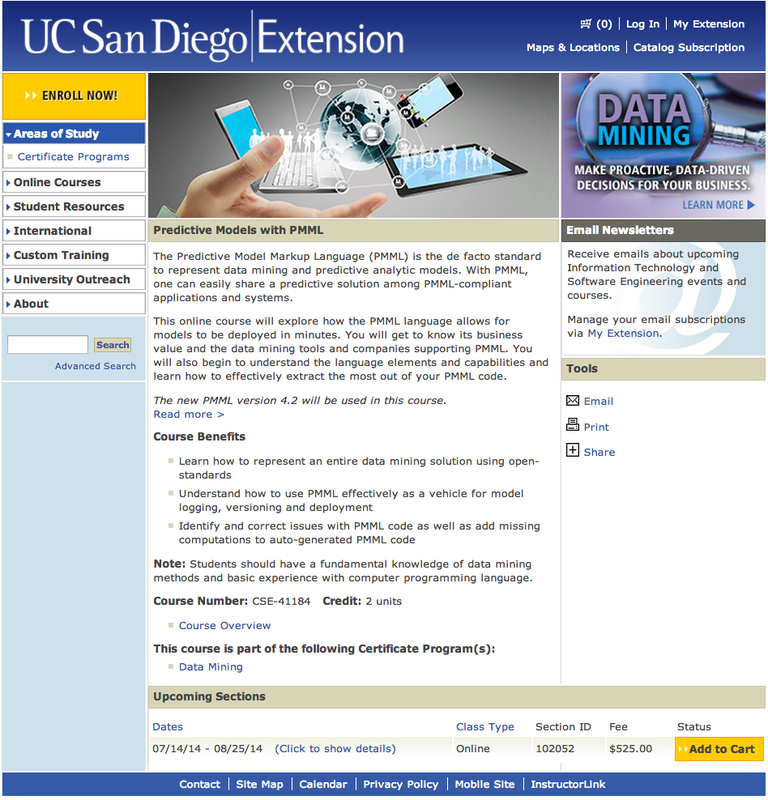 Zementis has paired up with UCSD Extension to offer the first online PMML course. This is a great opportunity for individuals and companies alike to master PMML so that they can muster their predictive analytics resources around a single standard and in doing so, benefit from all it can offer. PMML is supported by most commercial and open-source data mining tools. Companies and tools that support PMML include IBM SPSS, SAS, R, SAP KXEN, Zementis, KNIME, RapidMiner, FICO, StatSoft, Angoss, Microstrategy ... The standard itself is very mature and its latest release is version 4.2. For more details about PMML, please visit the Zementis PMML Resources page.